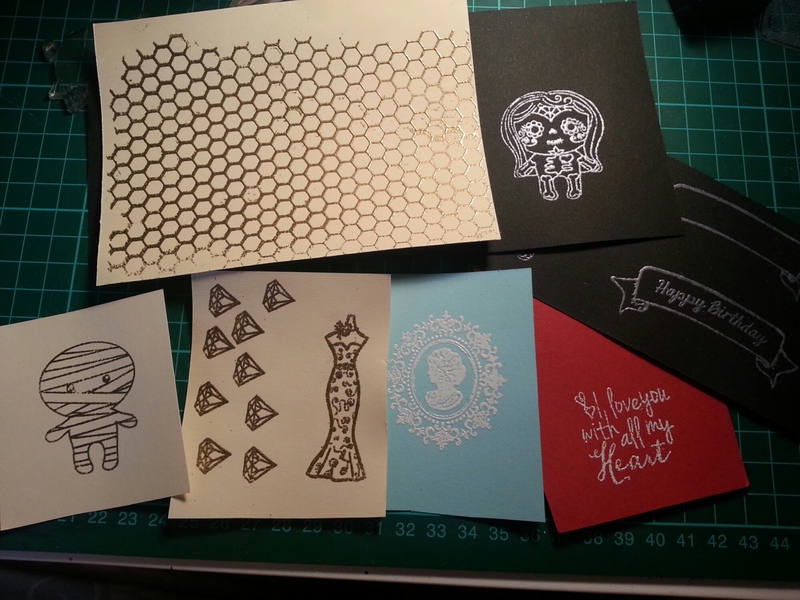 Instead of making things easier on myself, I decided to stamp out some of my own patterned paper to use on cards. I was watching YouTube again, and whenever I see people colouring on toned paper, I always get the urge to do it too, as it’s one of my favourite art types to do. 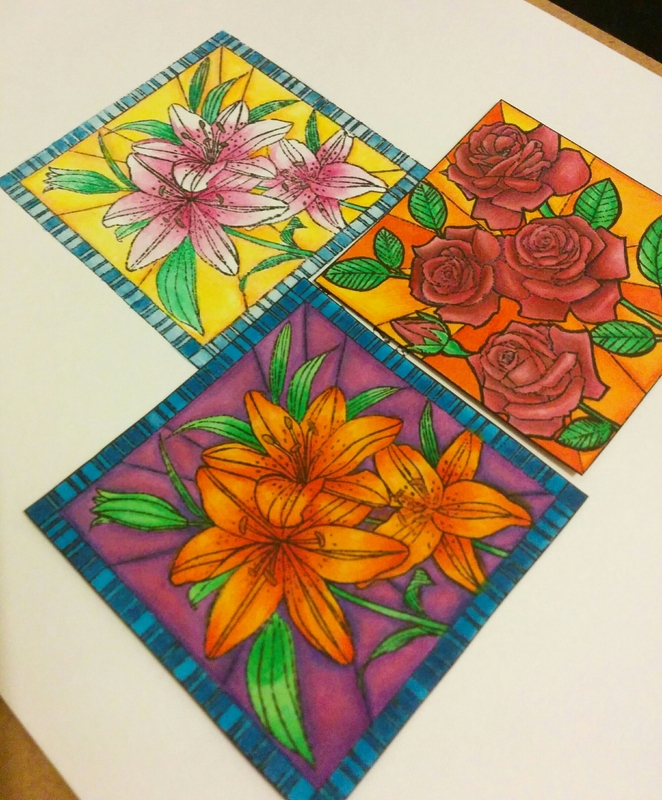 So I wanted to incorporate it into cardmaking, and the YouTuber made hers into a lovely card by colouring all the stamped images. I thought that looked great, but would be time consuming. 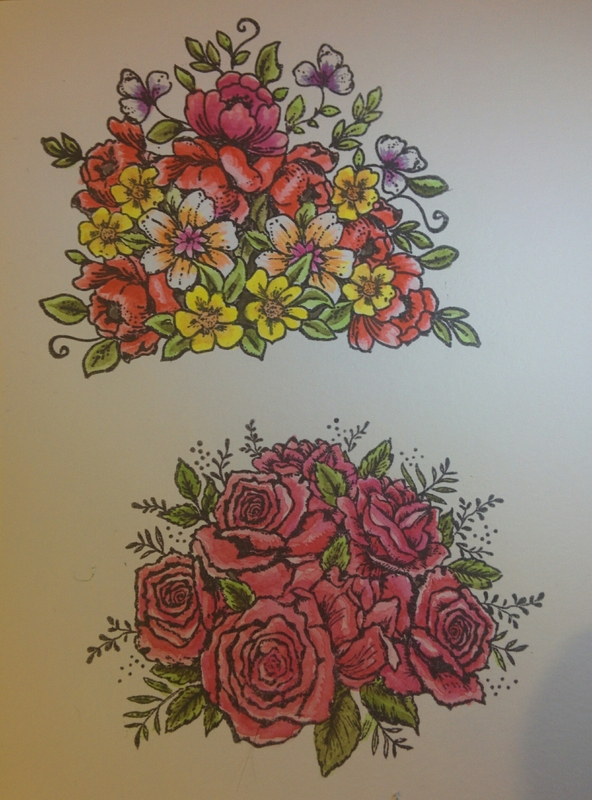 I was inspired to develop my own version by lining up one stamped image to colour, and stamp around this with just outlined ones on the rest of the paper. 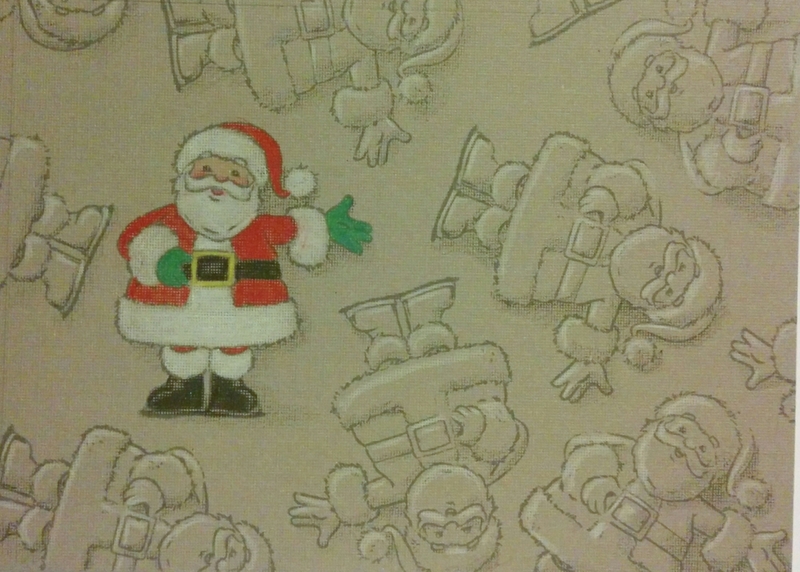 I ended up adding some simple shading on the background Santas, which makes them look more dimensional. I haven’t finished the colouring on the main Santa, but he’s in the right area to be pointing to a sentiment, which I hope looks as good as I’m imagining. It’s been a long day, goodnight. Anyway, I’ve been balancing between multiple projects, trying to keep the mess at bay and sleep. Not all going to plan, but slowly progressing while keeping myself busy. 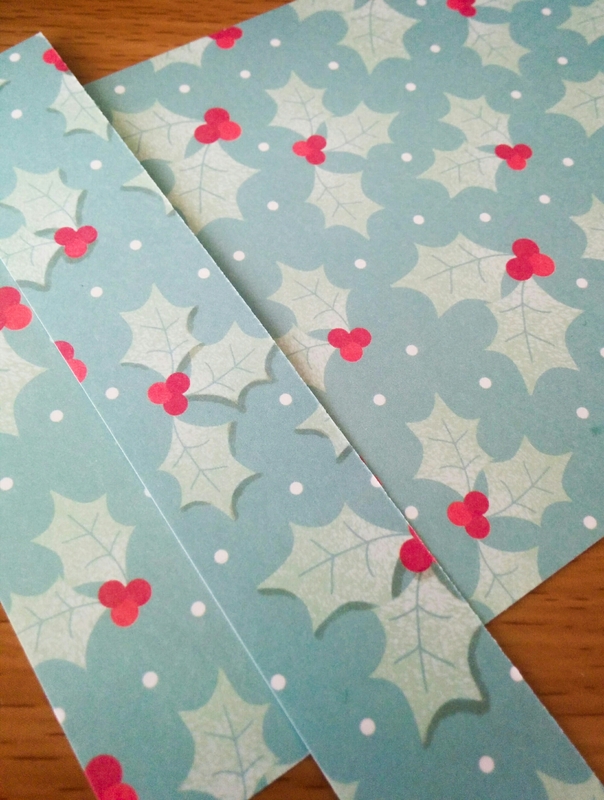 A couple of things I have discovered to improve my cardmaking that I can share, making the blog more than pretty pictures. The first, pictured above, is making patterned papers look fancier. There are heaps of ways of getting cheap paper, or paper that is a bit plain, and turn it into the expensive looking ones really easily. 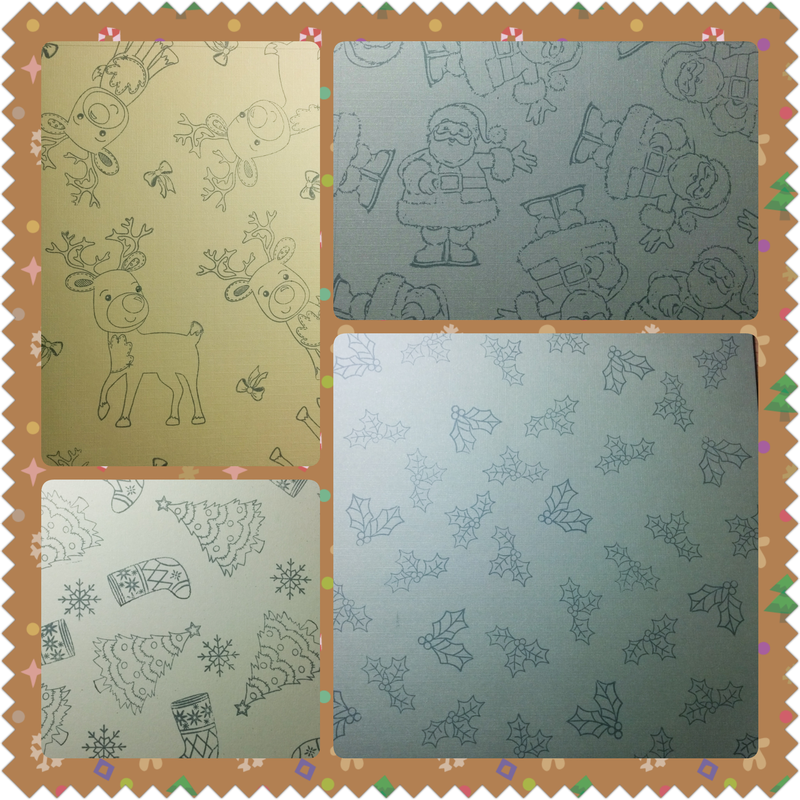 High grade papers often have dimension, glitter and glossy areas on the patterns. You can personally decorate patterns using a variety of materials, including glossy accents, glitter glue, shimmer pens, gel pens, fine liners, markers and so on. It’s very lenient, as it will depend on your tastes and what paper you have in your own stash. The paper shown in the picture was from a card kit that came with a magazine. I liked the pattern, but I experimented by adding a shadow to one side and I like it much more. Try different designs and use whatever you have to accentuate patterns and come up with your own creations. The other discovery came about when I was thinking about how bad I am at stamping, and I don’t like the mixed results when trying to get a good impression. This lead to the idea of scanning in the plastic stamp sheet that comes with the prestamped images. This worked well for me. Ensure you have a white sheet of paper behind when scanning, and this allows you to have the images on your computer to resize and print at any time. I was able to enlarge some stamps I have and print them in light grey, a colour I don’t own in ink pads. I had been stamping out all my stamps to keep on the computer anyway, but this way it’s already been stamped nicely. I hope these tips help. I have a huge amount of ideas for blogs. Getting to them is another story. 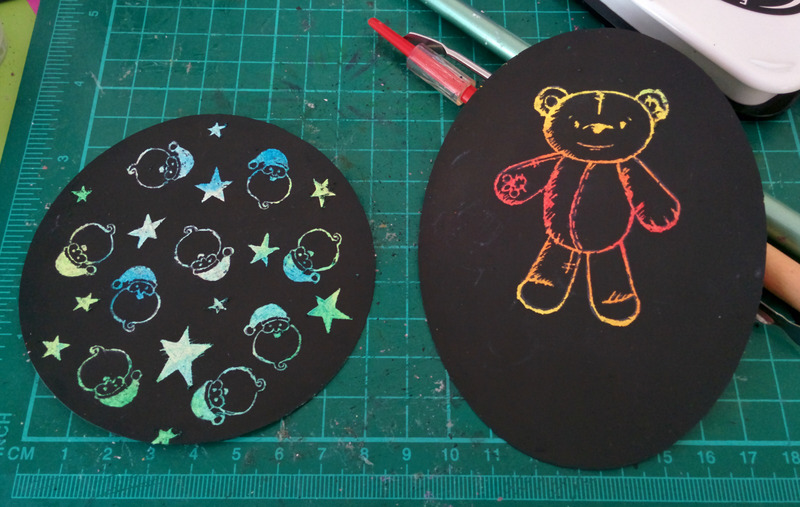 These are my own oil pastel scratch art papers. Unfortunately, I forgot what colours I had made them beneath the black. I guess blue Santas can be Christmassy. It is cold in the north pole. Perhaps, next time, I’ll write the colours on the back, though it is exciting to uncover the colours without knowing. Might work better for non-specifically coloured images, like the bear. 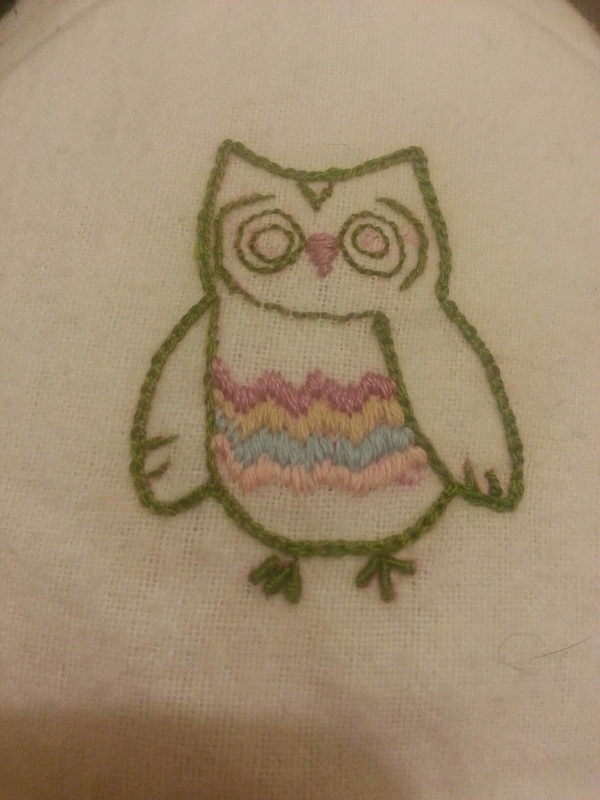 Crazy eyed embroidery owl. Yay! I decided to stamp on fabric and embroider the outline. I figured it’s easier than looking for a pattern, printing and tracing. I used a water based ink, so hopefully the bright pink won’t show after washing. I’ve never been great at satin stitch, stem stitch or bullion stitch, but ended up using all of them in this piece. I don’t think I did too badly. The image didn’t stamp properly, allowing for some leniency, but this caused problems when it came to the zig zags on the front of the owl. Looking back, lining the area to fill in with a straight stitch would have been wise. I was unsure of what to do with the eyes and what colour to make them, so they look strange for now. Perhaps a satin stitch in brown or something, as I thought using the same green would make them dull. There are a few stamps I have that would be nice to try with this technique, but I wanted to try something simple. I think I’ll use calico next time as well, since I used flannel that was a bit soft and having some sturdier fabric might help with stitching. If I knew what if be using it for, I could spray the fabric with hairspray, which makes it really stiff, but wouldn’t be suitable if I use the image for something soft. I suppose it would wash out after, but I suppose that another experiment to add to the list. 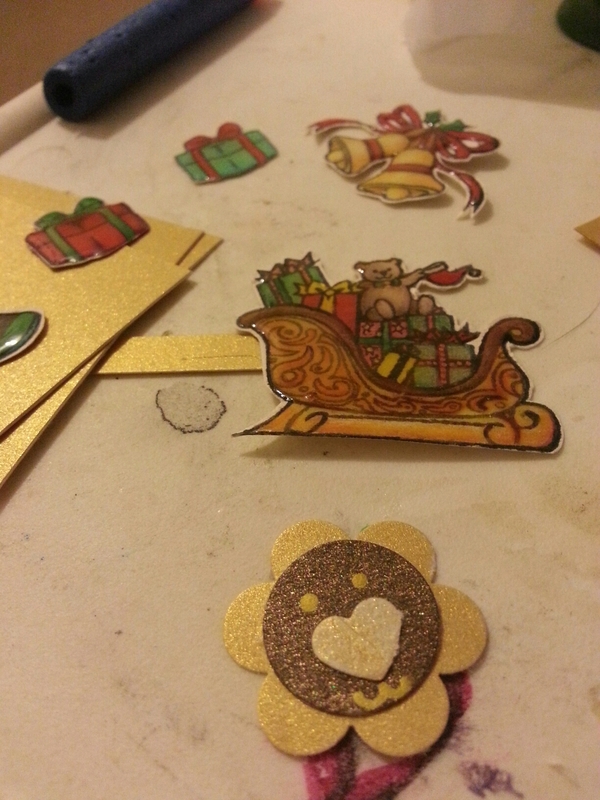 Stamping and colouring today, for some cards. Didn’t feel like doing a lot today, so I hauled my supplies to the lounge and coloured in front of the TV. I’m in a dilemma between wanting to use my copic markers and not wanting them to run out. Then the other dilemma of buying more singly or save up for 72. Either way has pros and cons, like travelling to the city or learning to save. Since my red has completely run out, I experimented, and found dark pink with maroon like shadows make a fairly good replacement. 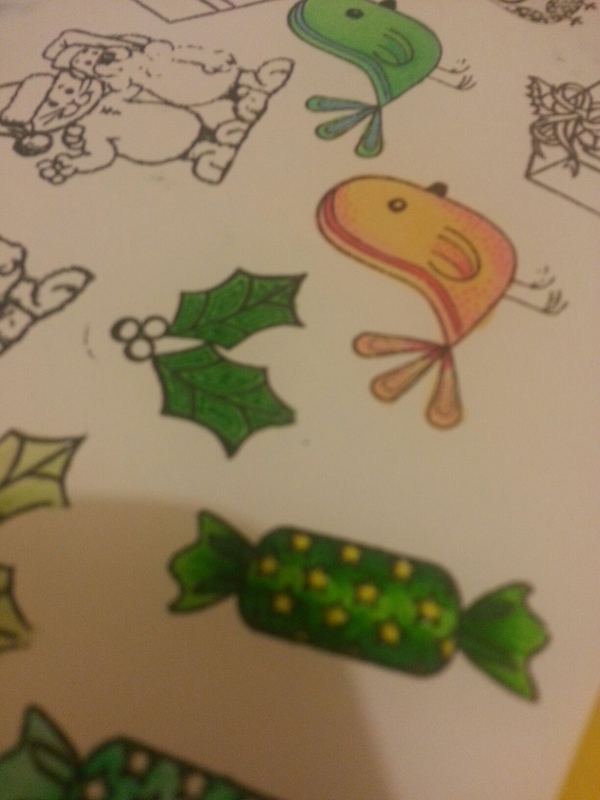 I might just have to get a red though, considering how many Santas I may need to colour in.